Congratulations to our Class of 2015 seniors. This year, two of our graduating seniors spoke at the Commencement Ceremony held at DAR Constitution Hall in Washington. Kirby Eule was selected to speak at the Graduation Ceremony. Vica Hicks spoke as the Senior Class President. The team qualified six students to the NCFL Grand National Tournament held in Fort Lauderdale, Florida. In addition to qualifying to the NCFL Grand National Tournament, Natalie Zur & Ari Ghasemian also qualified to the NSDA's National Tournament in Dallas, Texas. The team qualified three students to the VHSL 6A State Debate Championships. Rachel Geisel & Sophia Warnement, 10 and Emily Burke, 11 qualified in Student Congress. 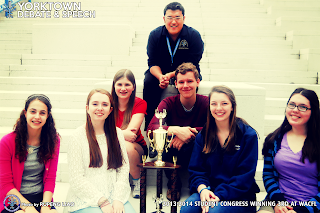 The Student Congress team captured First Place in WACFL Student Congress Sweepstakes. This is the first time that Yorktown has captured this honor in the past five years. The team was ranked 3rd last year. Congrats to all of our students who competed at WACFL 3 at Lake Braddock Secondary School. Emily Burke, on winning 2nd place. Emily has qualified to the MetroFinals tournament. Kirby Eule, on placing 3rd. Kirby has also qualified to the MetroFinals tournament. Samantha Williams, on continuing our five-year tradition on becoming our newest Outstanding Novice. Congrats to the following students on their accomplishments at WACFL 1 and 2 tournaments. Ari Ghasemian & Natalie Zur, on placing 3rd in the Varsity Division with a 4-0 record. They have qualified to the MetroFinals tournament. Evan Cater & John Trainum, on placing 6th in the Junior-Varsity Division with a 3-1 record. Emily Burke, on placing 3rd, Emily has qualified to the MetroFinals tournament. Kira Sweetman, on becoming our newest Outstanding Novice. Elina Kent & Vica Hicks, on placing 3rd in Duo. Elina and Vica have qualified to MetroFinals. Jenna Radke, on becoming the additional qualifier for MetroFinals in Declamation. The Varsity Letters are awarded to graduating seniors who have shown excellence in Debate & Speech and involvements throughout the years. The Award Plaques are given to the top two participants in each event category. This award honors the top students for their achievements in Debate & Speech. This award was created this year in honor of the late Mr. Frank Solomon, whom sadly passed away before the start of the school year. Mr. Solomon was a great friend and supporter of the team for more than ten years. This award honors students who are dedicated and have excelled in Debate & Speech. This award was created in honor of the late Ms. Eleanor E. Wright, former head coach of the team, President of National Catholic Forensic League, President Emeritus of the Washington-Arlington Forensic League, former director of VHSL's State Forensics tournament, and head-librarian at Yorktown. Ms. Wright passed away after suffering a massive stroke at a Student Congress tournament in February, 2003. This award recognizes parents, staff members, coaches, and volunteers who have contributed greatly to the team. This award was not presented this year. This page will be updated after 6A States Championship to be held on April 25th to 26th. Our Student Congress team was able to send the largest delegation from the 6A North Region to the 6A State Debate Championship. Congratulations to the students below. Updated: Speech's Duo team advances to Nationals. Congratulations to all students who have competed at the WACFL MetroFinals Tournament. 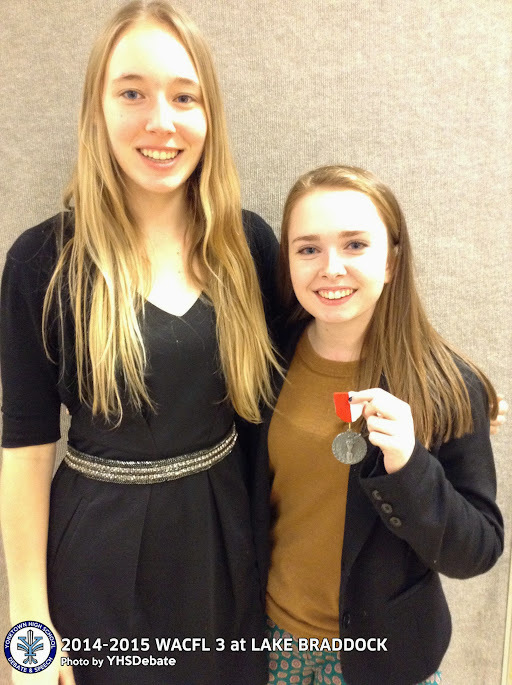 Vica Hicks & Elina Kent placed 5th in the Metropolitan Championships for Duo Interpretation. The Duo team qualified to the NCFL Grand Nationals to be held in Chicago, Illinois. Emily Burke, Kirby Eule, Rachel Geisel, and Valerie Marshall. Our Student Congress team was able to take home the third-place trophy for the WACFL Congress Sweepstakes Award this year. This is a team effort and we congratulate all of those who have participated in the WACFL Congress tournaments this year. 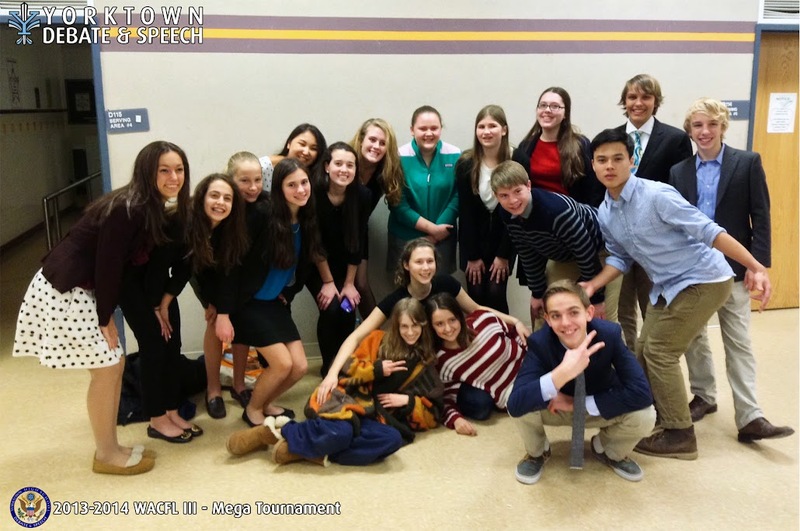 © 2014 Yorktown High School Debate & Speech Team. Congrats to the following students on their accomplishments at the WACFL 5 tournaments. Vica Hicks & Elina Kent on placing 6th in Duo Interpretation. They have qualified to the MetroFinals tournament. Emily Burke, on placing 2nd. Valerie Marshall, on placing 3rd. Rachel Geisel, Ned Schweikert, and Kirby Eule on qualifying to the MetroFinals tournament. This post will be updated on March 29th, after students compete at the State Championships. For individual events, special shout out goes to the students below. Charlotte will advance into States. Congratulations to the Yorktown HS Speech Team on taking home third at the first VHSL Liberty Conference 6 Forensics Championship. For individual events, special shout out goes to the students below. These students qualified to the Regional Championship to be held on February 18th. WACFL 4 tournament is done! We would like to thank the parents who volunteered to judge at the Congress tournament. Our students were able to capture honors in all of the categories we competed in. Vica Hicks & Elina Kent on placing 2nd in Duo Interpretation. They qualified to Metro Finals. Ned Schweikert, on placing 1st as well as being voted by peers as the Outstanding Senator. Congratulations to all the students who took part in the WACFL 3 mega tournament. We would also like to thank the parents who volunteered to judge at this tournament. Our students were able to capture honors in all of the categories we competed in. Lauren Berry on placing 5th with a 4-0 record in the Novice Division. Andrew Burkholder & Nick Varley on placing 2nd in the Junior-Varsity division. They qualified to Metro Finals and advanced into the Varsity division. Vica Hicks & Elina Kent on placing 3rd in Duo Interpretation. They qualified to Metro Finals. Christina Mack & Sophia Warnement on becoming our newest Outstanding Novices. 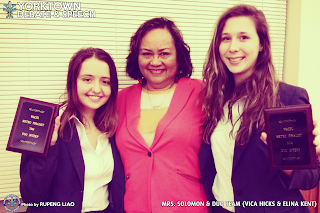 © 2013 Yorktown High School Debate & Speech Team.